Our new crop of carrots start next week. We should be back to our normal bunches then. We are should have enough tomatoes as well! Alex Frecker, of Frecker Farms is a good friend of ours. He’s worked with Givens farms for over 10 years and we are always happy to support his new farm down in Carpinteria. Unfortunately he doesn’t have enough to supply our whole CSA, but we are able to get some of his variety in our large shares. We have cheese available from Casitas Valley Creamery, the same farm we get our apples from. Fresh feta cheese in a range of flavors are offered in the store. They are delicious! Please make sure if you order cheese, that your box will not be sitting on your porch for a few hours. We also have granola made fresh to order in 4 different flavors which are gluten free or certified organic. This entry was posted in Uncategorized on September 29, 2014 by Carolyn. Having our farm so close to the beach in Goleta has a lot of great advantages. We stay cooler in the hot temperatures and mild all year round. But it also brings in a lot of moisture that makes growing things difficult at times. Our carrot tops have a bad case of mildew and so we are only harvesting the roots for the time being. We are able to put more carrots in each share this way. Same carrots, just without their tops. Want more fruit in your share? We are trying out our new fruit expansion add on for $7. About 2-3 lbs of organic fruit, packed in a paper bag and added in with your share. As the seasons change, so will the fruit and the quantities. We are in between a lot of vegetable crops on the farm. Tomatoes will be back soon, but we had to take a temporary break. We are also looking forward to a lot of spinach in the future. I love kale, but it will be nice to see a different green in the box. Chard is on the way too. I believe this will be the last week for the ambrosia melon, so savor that last glimpse of summer as we head into fall! This entry was posted in Uncategorized on September 22, 2014 by Carolyn. it has been so hot and dry on the farm. It’s been a struggle to keep up with watering and the bugs are going crazy. That’s why you have not seen spinach, arugula, cauliflower, broccoli and more. We just don’t have a chance at making progress with these crops until it cools down, rains or both. We also had some deer eat through a crop of cucumbers and the plants and got into our watermelon stash as well. I guess everyone is looking for something to quench their thirst. Local granola is back in action after much demand. Your granola is locally made and by purchasing it your money is staying right here in Goleta. With different choices like Organic Rasin Pecan, Cranberry Cashew or Gluten Free Coconut Seed or Walnut Spice there are many different delicious and healthy flavors to keep you going. We are also looking into making home made salad dressings. My biggest complaint with store bought dressings is the cheap oil/products they use to make them. After making a huge, delicious salad, the last thing you want to poor over it is store bought salad dressing! We will get those up and going and will let you know when they are available. Make dressing: combine all ingredients together, stirring until combined. Mix kale and dressing together, allowing the mustard dressing to soften the kale. Assemble wrap starting with avocado, then add cucumber, and finally add the mustard kale. Preheat a large sauté pan on medium. Add the walnuts, and toast, stirring often, until fragrant and lightly browned, about 3 minutes. Do not allow to burn. Set aside to cool. Chop off ends of each zucchini. 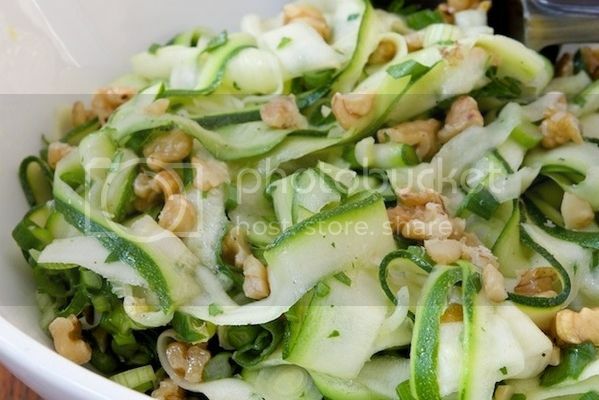 Using a vegetable peeler, shave the zucchini into a large bowl, creating long strips. Discard the seedy center. Add olive oil, lemon zest, lemon juice, sea salt and black pepper to a small bowl and whisk. Add to the salad and mix well. Roughly chop the cooled walnuts and add to the salad, along with the green onions and cilantro. Mix well. Mix everything, adjust seasoning if needed and serve. Place the stock in a medium saucepan and bring to boil. Add the chicken breasts to the boiling stock then remove from heat and cover to poach for 25 minutes, turning once. You want to ensure the chicken breasts are fully submerged in the liquid to ensure even cooking. Combine the cucumber, onions, zucchini, carrots and lettuce in a large bowl and lightly season with salt and pepper. Remove the chicken from the poaching liquid and shred into bite sized pieces and add to salad. To make the salad dressing, combine the almond butter, oils and honey in a food processor and combine. Add ¼ cup of the poaching liquid and process until smooth. 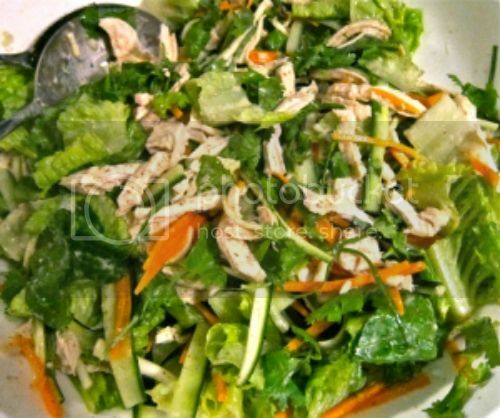 Drizzle dressing over the chicken salad, garnish with the fresh coriander and serve. This entry was posted in Uncategorized on September 15, 2014 by Carolyn. We’ve added a fruit expansion option to our CSA boxes. We don’t grow a lot of fruit on the farm at the current time, although we’ve planted raspberries and blackberries and have a lot of citrus trees in our future. But maybe you’d like to see a few more lbs of fruit in your share each week (or bi-weekly). Check out our new fruit option and feedback is always appreciated. We are bringing back cheese from Casitas Valley Creamery, located in Ojai. Fresh feta and cheddar curds will be available as early as next week and their aged cheeses will follow behind. Keep an eye out for that in our CSA Store. We are also up to about 100 chickens again and will be able to accommodate a lot more orders in the spring. Raising chickens has proven to be very difficult for us. Being on 50 acres of open land leaves a lot of open space for predators to make chicken their dinner. But it has been rewarding too. Working with the hens can be very calming and making them happy makes me very happy. Right now they are feasting on romaine lettuce that bolted, melons, old butternut squash and more. 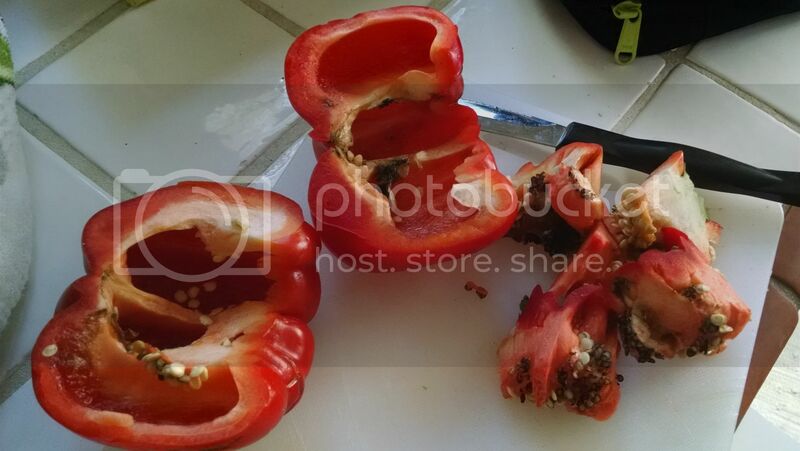 This entry was posted in Uncategorized on September 8, 2014 by Carolyn. We are back in school! St. Raphael, Mountain View, Cold Spring Elementary and Westmont to be specific. If you have picked up your CSA box here in the past or want to pick up your share here in the upcoming weeks, please log into your account and change your pick up location. Feel free to email me with questions. Have you ever visited Scarlett Begonia, a delicious restaurant downtown Santa Barbara? We happen to be very close family friends and we sell the same bread, muffins, scones and biscuits through our CSA program. All bread is made fresh the night before you receive it and is made right here in town. Consider purchasing from Deux Bakery for all your bread needs. Casitas Valley Creamery will be back up and running soon and we will be offering their new line of fresh cheeses, with their aged cheeses following close behind. Last, but not least – our chickens! We are only getting about 12 dozen per week with our latest loss in population. Our egg subscriptions are maxed out and that’s why you do not see eggs posted in our CSA store at the current time. Subscribing to our eggs means you get priority on the dozens. We have 30 more chick-letts up and coming so please keep an eye out for more eggs in the store. This entry was posted in Uncategorized on September 1, 2014 by Carolyn.